Written for photographers of all levels, PaintShop Pro X6 for Photographers is packed with inspirational, full-color images and easy-to-follow step-by-step projects that will have you producing great images in PaintShop Pro in no time! Everything you need to enhance and improve your digital photography is right here in this Corel® endorsed guide. In this new edition, Ken McMahon looks at the pros and cons of the new, faster 64-bit version of the software and covers new features, including working with the Instant Effects palette, using the Smart selection brush, mapping photos, automatically tagging people, and uploading to Facebook, Flickr, and Google+. Other program features—selections, masking, layers, adjustments and effects, HDR, and scripting—are explained through practical examples that are just as relevant for older versions of the software. 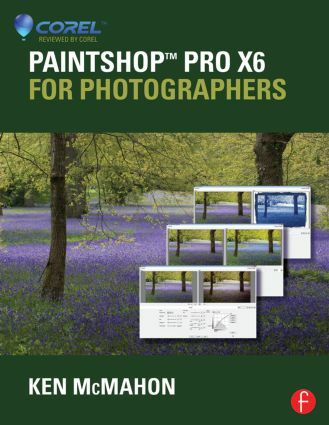 This book has everything a photographer needs to take their photos to the next level with PaintShop Pro. Learn from PaintShop Pro expert Ken McMahon with the most authoritative book on PaintShop Pro endorsed by Corel®. Completely revised and updated with all of the new features in X6—get up to speed with 64-bit processing power, new selection tools, workspace enhancements, and much more. A complete learning package with full-color screen shots and examples, and step-by-step projects at the end of each chapter.